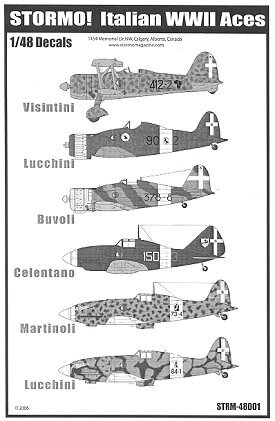 Stormo Magazine has produced a sheet of decals covering Italian Aces of WWII. In addition to six aces, there are six different aircraft covered, making this a most useful sheet. 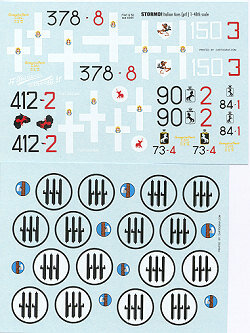 The sheet includes only the unique markings and four sets of insignia. Any data markings and additional insignia will need to come from the kit. The sheet also includes the tail cross for five of the aircraft. So what is on the sheet? First is a CR-42 flown by Tenente Mario Visintini who scored 16 kills. For this, the Classic Airframes kit is recommended, though you could easily use the Italeri kit as well. Next is the Macchi C.200 of Tenente Franco Luccini with 21 victories. The Pac Models kit is recommended for this. The Fiat G.50 is for Sargente Maggiore Aldo Buvoili who had 6 claims. The Flying Machines kit is recommended, though those with the Sector kit may want to use that one. Tenente Agostino Celentano flew the Re.2000 and had 7 claims. The Classic Airframes kit is the choice for this. Next is Sergente Maggiore Tersio Marinoli's Macchi 202. He had 22 kills and the Hasegawa kit is the one for this plane. The other Macchi 202 is for Capitano Franco Luccini and in an unusual camouflage scheme. Instructions are in shades of grey and provide a profile for each aircraft. There are directions to use the kit instructions for any upper surface markings plans, which is really not a problem, for most of these markings are standard. The decals themselves are superbly printed by Cartograf and quite thin, making for a logical choice for your next project. Review copy courtesy of Stormo Magazine. Add $2.99 s&h to each order. If you would like your product reviewed fairly and quickly by a site that has well over 325,000 visitors a month, please contact me or see other details in the Note to Contributors.